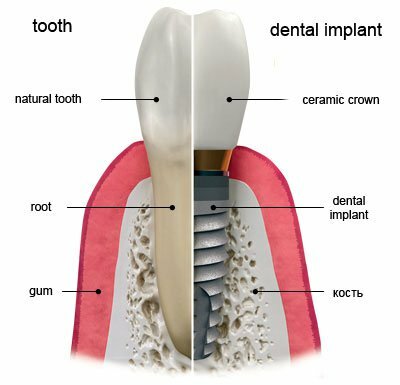 Dental implant is a small titanium construction, which is used to replace the root portion of a missing natural tooth. Over time it will “fuse” with the bone and serves as a support for fixation of crown, which fully replaces the lost tooth. Am I a potential candidate for implantation? Yes, if you are missing one or more teeth. Your dentist will discuss your personal case with you. Thanks to dental implants you can smile with confidence, speak and eat without feeling any discomfort. What are the advantages of dental implants over traditional dentures? Aesthetics: The appearance of a person should not change with the loss of a tooth. Dental implant allows you to replace one or more missing teeth and is a reasonable alternative to conventional treatment. Thanks to dental implants you can improve your appearance, speech, chewing ability and to get pleasure from your favorite foods. Preservation of natural teeth: The traditional approach of manufacturing and fixing dental bridgework requires processing and depulpation of two (sometimes more) of the contiguous teeth. This significantly reduces the “life” of these teeth. Dental implants allow you to avoid the necessity of preparation of healthy teeth. Prevent jaw bone resorption: The timely reimbursement of missing teeth with implants prevents resorption (resorption, decrease in volume) of the jaw bone. The resorption develops due to the absence of the natural load on the bone that was previously created by teeth. This can lead to displacement and the subsequent loss of contiguous teeth and in the future it can lead to change of the shape of the face, as the jawbone shape the face. Preservation of jaw bone in the original volume will help to preserve the natural contours of your face. Comfort: You won’t worry about presence of removable parts. The implant is stable and comfortable. After installation it does not require any adjustment. Usually it can serve throughout life. Confidence: No need to be shy and suffer from the discomfort caused by tooth loss. Your teeth will look, feel and function like natural. How much time is required for implant treatment? The dental implant is placed into the jaw bone through a short operation under local anesthesia in office based conditions. It is followed by a period of healing and osseointegration with bone tissue of the jaw, this period may last from three (on lower jaw bone) to six (on upper jaw bone) months. Thus the reliable basis for long-term and stable fixation of the denture is formed. If you have a bone deficiency, you will need bone grafting, which in turn will affect the duration of the implantation process. 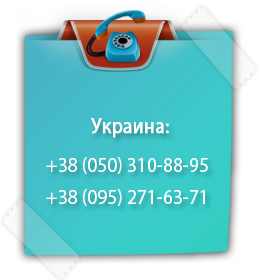 Your doctor will be able to determine exactly what needs to be done in your case. To what extend is the implantation process painful? As a rule, it is completely painless. Implantation is performed under local anesthesia (sometimes other forms of anesthesia can be used for). After surgery you may feel not intense pain, but no longer than 72 hours. Analgesics, which are sold without prescription, will help to ease the pain. Can the implant be rejected by the body? The implant made from surgical titanium alloy, which is a biocompatible material. The cases, when the implant is not accustomed, are very rear. In these cases the implant is replaced by another. 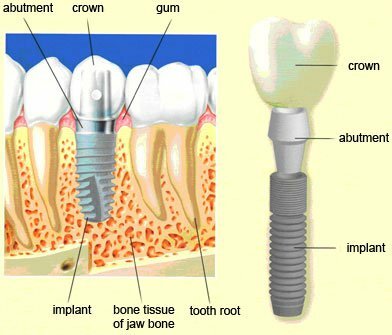 What treatment does the implant need after its installation? The implant requires the same careful treatment as a natural tooth does. Clean it with a toothbrush, as well as natural teeth. How long do the implants serve? The service life of the implants depends on the health and physiological characteristics of the patient, the availability of harmful habits and proper care of the mouth cavity.